Ok so I might have spoke too soon on that last post. Yesterday the temperature dropped right on through the center of the earth. You could hear the cold. It was -30 below with a -40 below windchill. When I was ready to go out for the day this is what I found waiting for me on the inside of my door. Isa spent a good hour entertaining herself by scratching the ice off the window from the inside. We wish you all a Happy New Year! I hope it is warm. We have been singing a lot of Jimmy Buffet lately. Sing it with us won't you? I gotta go where its warm! It is Christmas Eve here at our house. It is a quiet night tonight. We chose to stay here in Unalakleet away from family and close friends. It was a tough decision but a good one. Although we are a bit lonely tonight we are thankful for everything we have been given and experienced this year. We are happy to spend a quiet evening as a family. Jeremy and Isa are out (7:30pm) cross-country skiing trying to spot Santa flying over head. After they come in we will read the Little House on the Prairie chapter about Mr. Edwards meeting Santa on the way to Plum Creek. Then we will spend a little time thinking about what we are thankful for and what we are hopeful for next year. There are many things that make living in the bush difficult but for every one of those difficulties we can find "blessings". One of those blessings is the distance we have from any commercialization of this holiday. There are no Christmas signs, no toy rushes, we could not go out shopping on Christmas eve even if we wanted to, and trust me we do not want to. Christmas out here has to be about your family, about the simple things. We miss our extended family and our friends by being out here, but being out here we learn to value you even more in your absence. There are no distractions or consumer ways to fill a void created by the loss of family and friends. The quiet tonight will make all of those joyful celebrations with family and friends all the merrier when we are lucky enough to celebrate with you again. 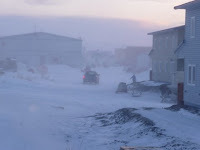 Today is the shortest day of the year (3 hours long here in Unalakleet) and the official first day of Winter. Things start getting lighter and lighter now. We are celebrating Winter Solstice the way we always do, without lights. We celebrate solstice without lights in order to feel the darkness around us. It is only through feeling the darkness that you can truly appreciate the light. It also helps to give us an appreciation of modern lighting. Try cooking your breakfast, making your bed, brushing your teeth all just by the light of a candle. Once you do you start to wonder about all of the cultures past and present that lived and continue to live without the electric light. One More Day Until Solstice! Here are some more photos from our Tundra Home. The first photo was taken this morning at 10:00 am. Here are Isa and Judy "playing out" the day before solstice. This photo was taken at 11:00am! If you look close at the picture you can see the moon in the top right corner. Jeremy took off today for a snowmachine ride up river and was able to take these pictures from a hill top. These were taken between 12:00-1:00pm. And finally for your viewing pleasure the sunset at 3:30pm. Sunset over the ocean, 2:45pm. Last night was Isa's school Christmas play. It was very cute. Everyone from preschool to highschool participated. Isa had to memorize a part and recite it. She got every word and was quite a ham as you can imagine. As you can see from the pictures Isa's class is primarily native as is her teacher. This joke was posted by Michelle on her blog, Pass The Flu Bug Please. Then, everyone takes a trip to the store where they compare types of light bulbs, as well as prices, and figure out how much change they’ll get if they buy two bulbs for $1.99 and pay with a five dollar bill. On the way home, a discussion develops over money. Finally, after building a ladder out of branches dragged from the woods, the light bulb is installed. I seem in recent posts to be a bit down about Unalakleet and Alaska. This is not true. Both Unalakleet and Alaska have lived up to my expectations of them. I will be contemplating the meaning of both for many years to come. My mental state has more to do with lighting and weather. To remedy this we have spent more time in front of our sun lamp soaking up vitamin D. Even our little Inupiaq daughter seems to benefit from a little light therapy. On a pleasant note, I found out that up here while the night is long, the morning/afternoon is filled with a beautiful sunrise until that sunrise gently turns into a sunset. It is absolutely stunning! Here is the sunrise we had today for about an hour and a half. The picture was taken about 12:40 pm. Tonight is Isa's Christmas play. She is in it despite only attending school in the afternoon. While she is excited about the play she has decided that she does not like school at all. It continues to be a struggle to get her to go to her cultural class in the afternoon. 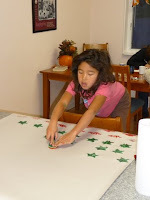 Here is a picture of her doing homeschool this morning. She has decided that she wants to learn calligraphy and spent most of the morning practicing. COUNTDOWN TO WINTER SOLSTICE: 8 DAYS! December is a cold hard month here in Unalakleet. As I have told some of you already the one thing I miss so far is winter. I know that sounds crazy but I miss the "friendly" winter. The winter up here is harsh and bitter. The snow is like sand blasting across the landscape. The bitter wind here blows all the time, 30-40 miles an hour. Sometimes there are wind gusts up to 70 miles an hour. It is also dark. 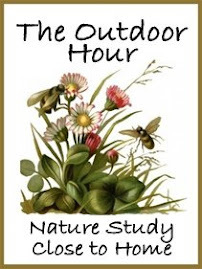 The sun rises now at about 12:15 and sets around 3:00pm. I miss the days where you go out sledding in those great big flakes. You know the ones that float down and you can catch on your tongue. If you did that here your sense of taste would be ruined because you would have no more taste buds. They would have been scoured off. Despite it all we do go out and try to enjoy ourselves, snowmachining, ice fishing, trying to stand up after the wind gust threw you off a hill. It is all fun. So we have been staying inside a lot lately. 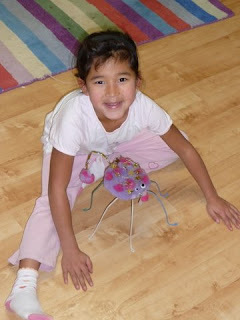 Today Jeremy and Isa spent the morning building a "Jitterbug". It was so cute watching the two of them work on it. They were quite the team. Isa did not have to talk too hard to get her dad enthusiastic about building it. Isa named her Jitterbug "dotsy" and it now jiggles endlessly across the floor. I am sitting here in my snug little apartment while a winter storm rages across the tundra outside. I grew up in Montana, lived in Idaho and Wyoming and I have never in my life seen weather like this. The temperature is somewhere around -5 with a wind chill of -20 or so. That is not so amazing but the wind good lord! 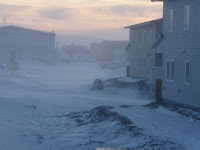 The wind blows down from the tundra and there is nothing to stop it. It blows 40-50 miles an hour and has wind burts of 60 miles an hour. That is hard enough that the wind just reaches inside your mouth down to your lungs and grabs the air right out of you. It leaves you feeling like you have had the wind knocked out of you. The snow is like sand from a sand blaster hitting you again and again as you try to stand in the wind. It knocks Isa right over and pushes her. Needless to say this pisses her off and she screams how much she hates the weather here. Of course you can't hear her over the wind. Still that is not the amazing part, that is not what leaves me speechless. As I gape open mouthed staring out side at the weather at 9:00 at night I can see two kids on a snowboard boarding down a hill by the school. I guess with this wind they can really get going......tough son of a guns! There are only 700 people in this village and in the last half hour that I have sat here looking out the window I have seen at least ten trucks, 7 four-wheelers, and 2 snow machines. Where in the world are these folks going and why????? My question is do they enjoy going out in this weather? A test of manhood? Some kind of initiation right of passage thing? Or are they just insane? The weather was just horrid when they showed up. I mean horrid! It was -21 with a windchill of -41. I am not joking! They had left 70 degree weather in Wyoming and braved the cold and snow to visit our home on the tundra. We then promptly set them back on a plane and flew the family to Nome for some big city (pop. 2200) experiences where Isa got sick and spent the next two days throwing up in the hotel bathroom. With that setback and Jeremy in classes Richard and Virginia had to brave the snow, ice, and cold and drive the roads around Nome all by the mselves. (A scary thought even in the summer.) They did it though and were rewarded with a rare view of the local Musk-ox population. They were told to pick up any souvenirs in Nome because there would be no place to buy anything once we got to Unalakleet. Two days later we were back on a plane flying back to Unalakleet. It was still bitter cold and many hours had to be spent indoors. Richard, a winter pro, even got frost bit while out on the snowmachine. While here they were able to meet all of our friends including Isa's friend Judy. 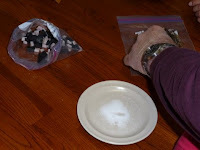 Judy's mom came over when she heard that Jeremy's parents were visiting and brought us some Muktuk (Raw whale fat and skin) for them to try. Virginia developed a taste for it. Richard tried it but decided to pass on any more. After the muktuk we took everyone out to the river for a little ice fishing. This is still one sport I just can not get into. 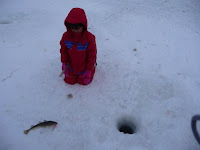 You sit on a little bucket over a little hole in -21 degree weather to catch fish. And they are not even salmon. They are some little trout fish and a thing called a smelt. We did our job and even Isa caught a little fish. I'll pass on the ice fishing but I can not wait to catch salmon in the fall! Most of our activities where like this one. Nice, warm, and snug inside the house making Christmas wrapping paper. Thank you Richard and Virginia. I hope you enjoyed it we sure did. Many of you have asked us "Why on Earth would anyone live in a place like Unalakleet?" Unalakleet sits out on a little strip of land sandwiched between the Unalakleet river and the Bering Sea just a few miles south of the Arctic Circle. I even found myself asking the same question the other day when it was -21, blowing wind, icy darkness and I was trying to take a walk. But then why do any of us live anywhere? People here have a sense of community. Everyone knows your name and your struggles. 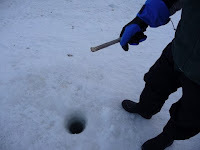 You know where to ice fish for trout and where for smelt. You love the food and the smells. You plan for the annual pick nick and Christmas bazaar. No one here asks where you are from. And the space, good God, the huge expanse of the ocean, frozen and open, and the land that goes on uninterrupted for hundreds and thousands of miles no roads, no power lines. It is enough to make Montana, Idaho, and yes even Wyoming seem over developed and over populated. For those of you of a more libertarian bent you have no need for a firewood permit, or a Christmas tree permit, or a burn permit. If you are native you need no fishing licenses, no hunting licenses. Ofcource with all of that freedom from oversight you are also left with no infrastructure. If you get lost in the woods there is no search and rescue. There are no fire trucks, no coast guard. But even that can feel like home to some. There is a great satisfaction in really taking responsibility for your own life. If you go out seal hunting on the ice you damn well better know what you are doing. No one will hold your hand and no one is going to be able to save you. If you know that and you are still able to live and thrive here you have a pride in your self and in your community made up of people like you. So why do people live here? The same reason we all live where we do, because it is home. And if you live here you get the extra bonus of being able to call yourself "bush" tough. We are finally settling into a rhythm here in Unalakleet. Isa and I are enjoying homeschooling. She fights me every day that she goes to school. She told me that she really likes to learn but hates going to school. Wise statement from one so young. 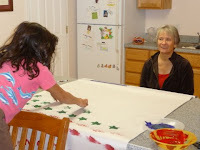 I told her that she was learning all of the time and part of what she was learning was taught by elders at the school. There was no way she could learn Inupiaq culture from me. So for now we are at an impasse. She still goes to her class three times a week for some formal "learning", and I get a bit of down time. 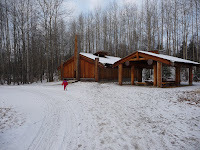 Speaking of homeschooling here are a few more photos from our trip to the Alaska Native Cultural Museum. This is what homeschooling is all about! We were able to take our time and visit all the houses at the museum on a day everyone else was in school. 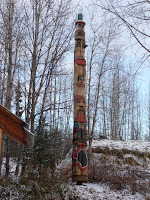 This is the Tlingit house. We were able to go inside but the camera did not take a very good picture. It is huge! Many families lived together in one house. 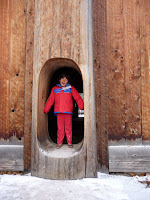 The house was great but the totem pole really caught Isa's attention. After visiting all of the houses we were able to view the movie on the making of the Totem. Very impressive, and it really seemed to make an impression on Isa. Much more so then just studying them in a book.